The Novato Lacrosse Club is offering a unique opportunity for lacrosse players – the Honor Badge. It may be worn as a patch on their uniform to display their honor and understanding of the privilege it is to be a player of this great game. A few years ago, Neil Duffy, a lacrosse Coach with Norfolk Academy, noticed the void of historical literature about the sport and decided to write The Spirit in the Stick. Mr. Duffy wanted to illustrate how lacrosse instills lasting values in just about every player that picks up a stick. The book describes the friendship, loyalty, dedication, perseverance, honesty and integrity that are learned and passed down to each and every player of the game. Copies of the self published book are available to purchase or are available to borrow from Novato Lacrosse Club. Visit TheSpiritInTheStick.com for more information. Players of all ages are encouraged to read The Spirit in the Stick. Upon completion, their Coach will ask them to answer a few questions related to the story. 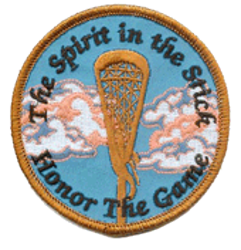 By demonstrating an understanding of the book, they will be awarded the Honor Badge which may be worn as their symbol of honor for the game of lacrosse. Fourteen-year-old Robbie Jones receives a 200-year-old lacrosse stick, passed down several generations, by Hall-of-Fame lacrosse player Capt. James Lewis, (retired US Navy). Robbie has no idea what he is about to learn from Lewis... or the stick.